Keep cool this summer with your own coffee filter fan! We decorated ours with Japanese cherry blossoms, which represent the beauty of life. Fold a large coffee filter in half and cut out the middle circle, as shown. Unfold the filter and cut along the folded edge to create two pieces. Paint brown branches for the cherry blossoms. Be random in your placement and try to squiggle some of the branches, so it looks more realistic. Cut pink tissue paper into small squares. Crumple and pinch the tissue paper into small “flowers” then glue onto the “branches” you painted! Flip one half over and glue five skinny sticks to the back, as shown. 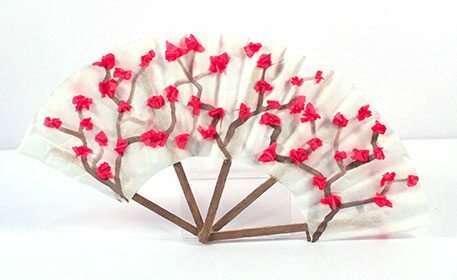 Glue the other half of the coffee filter on top of the first half, so both sides of your fan have cherry blossoms and the wood sticks are covered! Paint the skinny sticks dark brown so they match the branches on your fan! In Japan, the cherry blossom symbolizes the transformation of Japanese culture throughout the ages and the beauty of life. The cherry blossom trees only bloom for a short time, usually in the spring. After about a week they are at full bloom and then start falling off the trees. This short period of time is a reminder to the Japanese that life is beautiful, but short and time is precious.